ON THE morning of August 26th Indonesia's president-elect went for a walk. 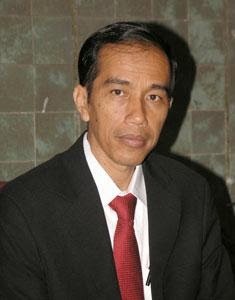 In one sense this was nothing new: as mayor of Solo and governor of Jakarta, Joko Widodo (pictured), universally known as Jokowi, frequently talked to his constituents on unannounced visits. Unusually for an Indonesian politician, he seemed to enjoy speaking to and learning from ordinary Indonesians. But this was Jokowi's first walkabout since Indonesia's constitutional court had officially confirmed his victory on August 21st, rejecting allegations of massive fraud brought by his defeated rival, Prabowo Subianto. The court's ruling meant that Jokowi had unfamiliar company on his stroll: a large presidential security detail. His guards stayed close by as he ambled around a development site. One admitted: "Jokowi's style is new and very different. We are still trying to adapt to [his] character." After a long and hard-fought campaign, Jokowi is at last preparing to govern. He will take office as Indonesia's second directly elected president on October 20th. His rival having been defeated (and having remained remarkably quiet despite a hint by his camp of possible violence if the ruling failed to go their way), Jokowi now turns to the much trickier task of placating allies, and of building a government as transformational as his candidacy. In that sense, his electoral victory is less a happy ending than an uncertain beginning. At 53, Jokowi is relatively young and offers a very different approach to politics from that of the ruling elites, represented by Mr Prabowo. Jokowi is a carpenter's son who used to run his family's furniture business. He is neither from the army, nor is he an offspring of any of the country's ruling political dynasties. He is seen as uncorrupt. Unlike many Javanese politicians, he is approachable, informal and a big fan of heavy-metal music. But in celebrating victory, his supporters should not forget that Jokowi nearly lost the fight, having slipped from a 30-point lead in the polls to a virtual tie. Mr Prabowo ran a masterful campaign, moderating his messages for different audiences and revelling in showmanship. Mr Prabowo's seven-party coalition controls a majority of seats in the national legislature, which means it could be difficult for Jokowi to pass bills. Jokowi will have to be circumspect in handling his inner circle, too. Some analysts believe he will be overshadowed by his party's boss, Megawati Sukarnoputri, who was Indonesia's president in 2001-04; and by his running-mate, Jusuf Kalla, who served as vice-president during the first term of Indonesia's outgoing head of state, Susilo Bambang Yudhoyono. Jokowi has denied rumours that he and Mr Kalla are already feuding over plans to streamline the cabinet. Jokowi will have to take some difficult decisions quickly. Foremost among them is how to implement his pledge to trim the country's disastrous fuel subsidies. Indonesians enjoy some of the cheapest petrol in South-East Asia, but the perk eats up around one-fifth of the country's budget. This leaves little room for spending on Jokowi's ambitious plans to provide all Indonesians with free health care and 12 years of state-funded education. The budget deficit is approaching its legally mandated cap of 3%. If oil producers raise their prices or oil imports become more expensive because of a drop in the value of the rupiah (it fell to a four-year low against the dollar in 2013), the budget will be even more squeezed--though the deficit cap could provide political cover to trim the popular subsidies. Jokowi will also need to wean Indonesia's economy off its dependence on resources, a task that Mr Yudhoyono felt no need to tackle in the fat years of his administration. Raw commodities such as coal, rubber and palm oil comprise the bulk of Indonesia's exports. They have helped to fuel a consumer boom. Retailers and consultants talk excitedly about the rapid emergence of a new middle class to rival India's, or even China's. Boston Consulting Group, for one, says that Indonesia is already home to 74m "middle-class and affluent" consumers and that the number will double by 2020. But as demand from China has fallen, so has the total value of Indonesian exports: from $204 billion in 2011 to $183 billion in 2013. If trends from the first half of this year persist, the value will fall further still. Little has been done to restructure the economy to boost demand at home and move manufacturing up the value chain. Almost nothing has been done to fix the country's dilapidated ports, roads and electricity supply (see chart). According to the World Bank, goods take longer to reach their destination in Indonesia than almost anywhere else in Asia. A poor, and deteriorating, education system is causing a severe shortage of skills. Indonesia's slowing growth is compounding these challenges. It fell from an average of 6.3% in 2010-12 to 5.8% in 2013, a four-year low. In June Indonesia's central bank predicted that this year's growth would be lower still, at less than 5.2%. That will be too low to provide employment for the millions of young people who enter the jobs market every year. Andry Asmoro, a senior economist at Bank Mandiri, the country's largest, says the demographic dividend "could be a demographic disaster". The departing Mr Yudhoyono has at least one feather in his cap. Hayono Isman, a legislator from the president's Democrat Party, says the fact that Mr Yudhoyono is preparing to leave office at all points to an important legacy: that he has "entrenched democracy". This is the first time in Indonesian history that a twice-elected president will hand power to a successor directly elected by the people. The country has come a long way since more than three decades of dictatorship under President Suharto ended in 1998. The election in July and its relatively trouble-free aftermath contrasts with democracy's regression in Thailand where the leader of a military coup, General Prayuth Chan-ocha, was appointed prime minister on August 21st by a legislature packed with his puppets. Government now changes hands in Indonesia, unlike in Singapore or Malaysia. Under Mr Yudhoyono, the centralised Suharto state has been replaced by almost its opposite, a highly decentralised system of administration. The semi-autonomous province of Aceh at the far west of the archipelago provides a striking example. Of all Indonesia's cities, none has endured as baleful a recent history as Banda Aceh, the province's capital. The city is coming up to the tenth anniversary of the tsunami that flattened the former sultanate on Boxing Day, 2004, killing about 167,000 people in Banda Aceh and the surrounding province. Before then Aceh had been embroiled in an almost 30-year struggle for self-rule with the Indonesian government that left tens of thousands dead. Yet today there are surprisingly few reminders of this tumultuous past. Banda Aceh has not only been rebuilt, but, as many locals are keen to emphasise, it is better than before. The army has gone. Many of the former Aceh guerrillas are now legislators of Partai Aceh, the dominant party in the local parliament. The city was helped by a massive influx of international aid money immediately after the tsunami. But it has since prospered without such handouts, buoyed by the rest of the country's rapid growth. The few physical reminders of Boxing Day 2004 survive only because they have been put to good use. One "tourist attraction" is a large fishing boat that was swept from its moorings onto the top of a house. "We are very opportunist," confesses one Acehnese. Other local governments have not been granted quite as much autonomy as Aceh, but they have still benefited from what Indonesians call pemekaran: a "blossoming" of democracy. District heads, or bupati, now command their own budgets and control their local schools and hospitals. Several even run their own football teams, complete with imported foreignplayers. Some analysts say Indonesia owes its unity to pemekaran, for it has allowed the conservative Muslims of Aceh as much as the more easy-going Balinese to express their unique cultural identities while staying loyal to the Javanese-dominated central government in Jakarta. Yet for all the country's new wealth and self-confidence, Mr Yudhoyono will still leave office largely unloved. The World Bank says that half the population still lives on less than $2 a day. Beyond the prospering city centres, poverty is still endemic. (In Aceh, maternal mortality rose from 2011 to 2012.) As in other fast-developing countries, wealth inequality in Indonesia has risen steeply. Democracy and decentralisation have not proved panaceas. Central-government handouts and lax oversight of spending have fuelled corruption at the local level. Voters are often bribed. Matters are just as bad higher up. Having promised to root out corruption when he was first elected in 2004, and despite the jailing of many officials for graft, Mr Yudhoyono's administration, particularly in its second term, has been swamped by it. Some say decentralisation has caused a grave decline in the rule of law. The writ of the central government now barely runs in some of the provinces, often with devastating consequences. Take deforestation--an important matter in what used to be one of the world's most forested and bio-diverse countries. After decades of unchecked illegal logging, often to clear land for palm-oil plantations, Mr Yudhoyono surprised many by bravely announcing in 2010 that he would impose a two-year moratorium on forest-clearing. He extended it last year for a further two years. But the problem has got even worse. A paper published in June by Nature Climate Change, an academic journal, said Indonesia had overtaken Brazil as the country with the world's highest rate of annual loss of primary, or old-growth, forest. Decentralisation could frustrate Jokowi, too. The big projects that are needed to revamp Indonesia's infrastructure will require a plethora of local approvals by people who may not agree with his plans. Mr Yudhoyono was an instinctive consensus builder. Jokowi will have to show leadership, starting with the selection of his cabinet. He will need all his courage to stand up to lobbying from the political parties that supported him; he needs to pick on merit, and avoid any hint of corruption. As a candidate Jokowi offered the welcome prospect of change. As the man in charge, he must be as good as his word.